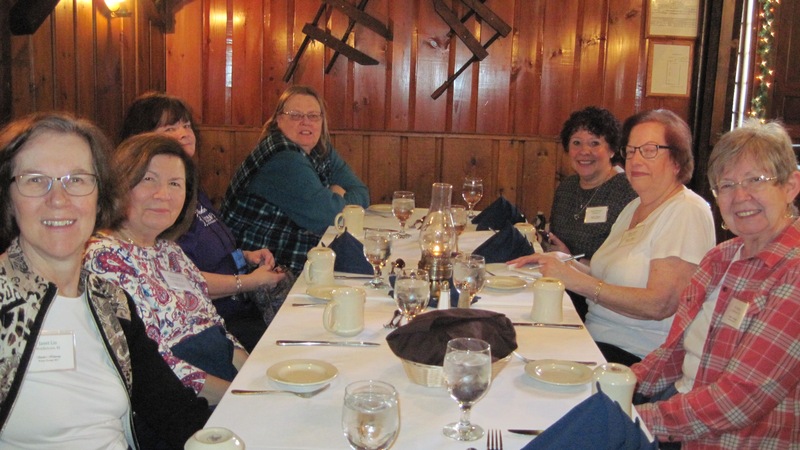 Two days at the Winter Stitching Retreat | NJNA is Blogging! 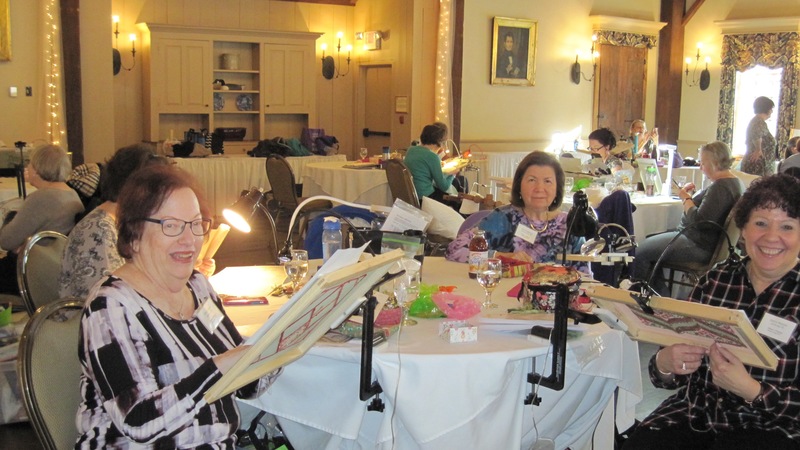 This past week I went up to Sturbridge, Massachusetts to the Winter Stitching Retreat run by Sue Donnelly. You could sign up for five days of stitching with great meals or less. As this was my first time, I decided to try two days. There were two other NJNA members stitching there this week, Ada D. and the mysterious Ellen S. They both spent all five days stitching. The retreat is held at the Publick House complex, a very old hotel. There were about ten tables of stitchers working on a variety of embroidery related items, some huge, some small, some cross stitch, some needlepoint and other techniques as well. As you know we are always looking for new tools for our hobby. 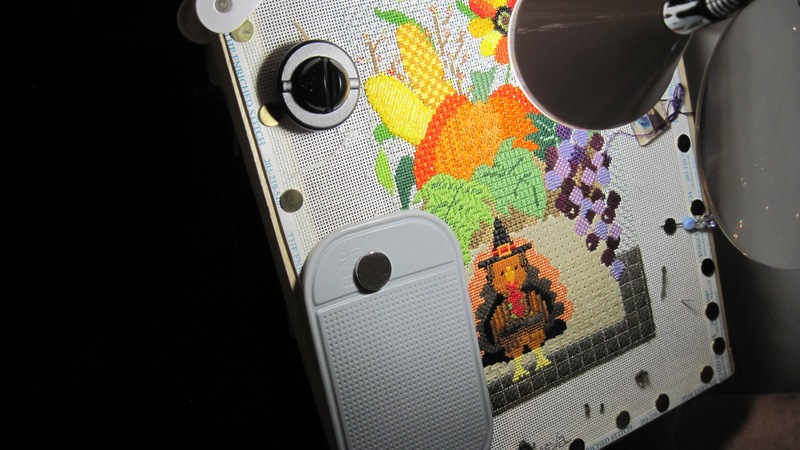 One woman was using a bead mat about the size of a 3 X 5 card held onto her canvas by a strong rare earth magnet. Nancy gave us all the information we need to buy one for ourselves! Meals were an important part of this retreat! We had a choice of about three main courses and three desserts for each lunch and dinner which we selected about a week before the event. I enjoyed everything and heard nothing from others except how good it was. The fruit offering for dessert at each meal was always fresh and loaded with flavor and there was always a delicious choice from the inn bakery. The waitstaff was always on top of things and ready to respond to a request for another cup of tea or coffee. Conversation and laughter flowed at every meal. The accommodations were very good and available in several places at the Publick House, in the main building, next door in a newer building and about a block away in a motel like building. I stayed in the motel, walked down for breakfast and then drove down for class as we did not want to walk up the hill after evening stitching in the dark. The weather was beautiful so the walk and distance was not an issue. Other inducements to come included a lovely reusable gift bag which included several design charts, a spool of Kreinik, a card of Weeks Dyeworks, a sample of lotion, Kreinik thread color chart, a button pin for the event for stitching. There was even a Victoria Sampler Christmas Cardinal stocking design with the thread/bead pack included. The hotel kept ice and ice water available at all times. Cookies were set out daily which I do not even try as I filled up at the meals. A nearby shop was the vendor with numerous cross stitch designs, a few accessories and a few Nancy’s Needle counted work designs. The owner would take orders for threads she carried and bring the threads in the following day for those requesting. Each evening after dinner about ten names were drawn for door prizes that had been donated primarily by companies such as Kreinik and 123stitch. If you think you might be interested, check the website for Stitchers Hideaway which should have the information posted for next year by mid March. So glad you enjoyed yourself, Sue. Sue Donnelly always does such a wonderful job organizing these events. I haven’t been to the winter stitching retreat yet, but I’ve done quite a few Fall classes through Stitcher’s Hideaway which are always great fun. Heading there again in October.